Have you ever had a great styling service at a salon, only to struggle recreating the look at home? It happens to everyone. Your stylist is a professional for a reason! They’re educated about tons of different techniques to give you the perfect look. However, it’s not always possible to make it to the salon before every big event. An at-home blowout will have to do when you’re in a time crunch. With the right products, you can come pretty close to the real thing. The first step is to prep your hair for the blowout. 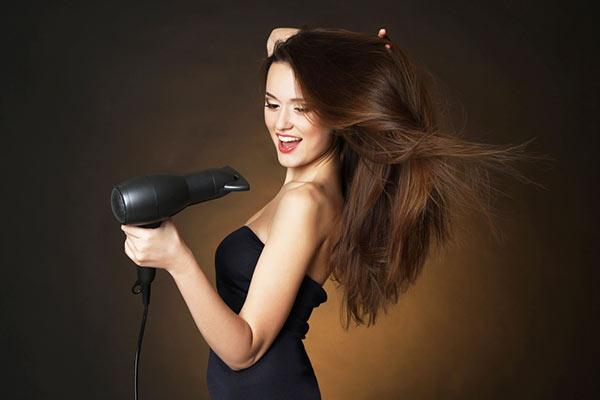 Professionals recommend that you lightly towel dry your hair to remove excess moisture before blowing it out. You hair should be damp, but not excessively wet. It’s also recommended to put a thermal protectant spray on your hair to protect it from heat damage. Give extra attention to the ends of your hair, as the ends are sensitive to breakage and damage. Once you prep your hair, you can begin your blowout. There are two key tools: the brush and the hairdryer. Both of these things will be a factor in whether your blowout comes out near-professional, or obviously homemade. It’s recommended that you use a rounded brush with nylon bristles. The nylon bristles are ideal because they will glide through your hair without pulling and damaging wet strands. You also need a good blow dryer. The ideal dryer for a blowout will have a tapered nozzle, allowing you to concentrate the heat on specific parts of your hair. If a regular dryer is too heavy, you could even try a handleless one. Divide your hair in sections, focusing on the sides and front of your hair. Make sure to brush in a downward direction to prevent frizz. As you dry, try to hold the dryer a few inches away from your head. You don’t want to fry your hair! Also make sure you’re not twisting the brush too much when you brush it through. Turning the brush excessively will cause tangles and knots. It’s best to brush through lightly. Your hair is more susceptible to breakage when it’s wet. Once you’re finished, don’t forget the final step! Use a finishing spray to lock strands in place. All of the above products are available in our online store, but you could also get recommendations from a stylist at Meraki Hair & Makeup Studio. Your stylist will always be happy to help you find products to achieve a salon-quality look at home. You can find us at 1281 Arthur Kill Road in Staten Island or call 718.966.6601. You can also download our app for free from iTunes or Google Play.